How do I drive a sled? During the first day the guides will explain how to harness and unharness the team. Mushers usually help feed their huskies as this helps build a closer partnership between musher and the huskies. The guides are very helpful and are pleased to pass on their years of dog-sledding experience, in an informal way, all week long. On safari we usually use four to ten-dog teams, although this is reviewed to suit individual mushers. In a six-dog team or more, the dogs are harnessed in pairs, the two nearest the sled are the wheel-dogs, the middle pair are the team-dogs and the front two are the leaders. Engholm husky tours / expeditions vary in their physical demands. On our tours, we are depended just upon ourselves, not upon snowmobile or any other remedies. We try to make it as intimate as possible to ride a dogsled. Our experience is that this is the only way to connect human, dog and nature to one whole. The tour starts directly from the lodge over a hilly stretch, lakes and marshes. We drive in varied terrain, and we stop for a lunch break around an open fire. That gives close-up nature impressions. Engholm Husky tours go far off the beaten track, break our own trail, using the freedom that good sled dogs give. That gives the opportunity to experience the wilderness and meet wildlife. For participants who have a good experience with dog sledding, it is common to drive their own dog team. With participants without previous experience of dog sledding, we normal start out driving a tandem team with 2 sleds and 8 dogs. It has several advantages; There is two persons to break and hold the team. When (not If) one participant tips over with the sled it is safe and comforting to have a second team member as backup and braking the dogs. If the dogs for some reason need assistance, one participant can solve the matter while the other is on the brake. This method is often used at Engholm Husky. The guides always do it and most guests – adult and young – choose tandem for comfort of sharing the responsibility. It does absolutely not make the experience any less. It is a huge misunderstanding to think that it is better to have own team, or that the bigger team the better. We will continue to strive for satisfied and happy guests which are our livelihood. However never if it means to have less safety and control. It is very easy to disconnect the sleds from each other so that there will be two single teams. The guide and participants decide together whether it is best with double or single team. At week tours becomes gradually more single teams but not so often at 3-day tours. That is too few days for most people to learn to drive the sled safely, without losing the team that could harm the dogs seriously. The starts are high-adrenaline moments, for the huskies and the mushers. On average there are four to six mushers on safari, plus guides; resulting in about forty to fifty huskies who all know its time for 'walkies'. The atmosphere can be electric and deafening. At rest, the sleds are tied to an immovable object such as a tree. When starting hold the sled firmly with both hand (the huskies will be pulling strongly) and stand with one foot on a sled runner and the other foot on the brake when the knot is untied. When cornering, lean into the corner as you would on a bike and move your weight onto the inside runner. On tight, fast corners you should also lower your centre of gravity by crouching down low. Mushers who lean into corners, put their weight on the inside runner and who crouch low, rarely fall off. 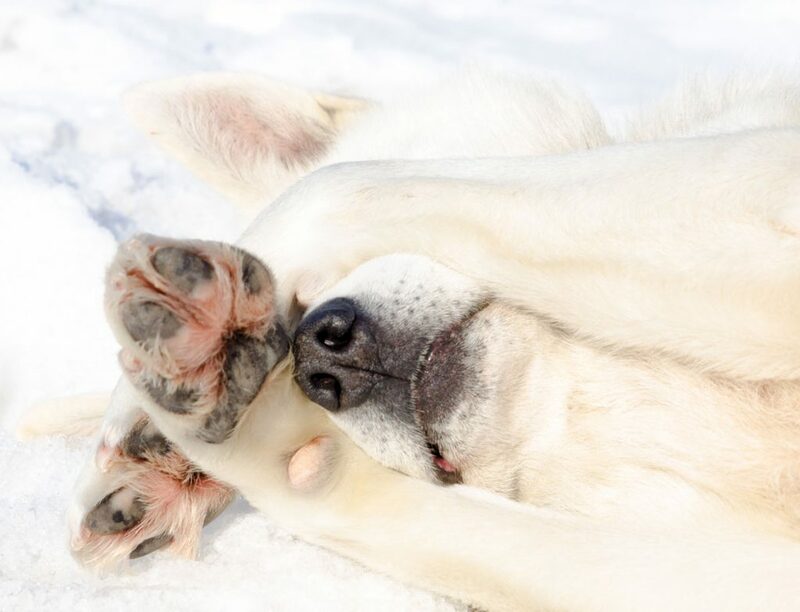 The most common difficulty for novice mushers is being able to relax when mushing. The adrenaline and the fear of falling off usually makes novice mushers tense up, especially their neck, shoulders and arms, becoming almost rigid as they hold on tightly. Tensing up exhausts the musher very quickly. It also increases the likelihood of falling off. It is important to have a fluid, relaxed stance that can react freely to the twists, turns and bumps in the trail. A good test of advanced mushing skills is to close your eyes, while going along. This encourages a light, fluid stance that can react quickly to the bumps and turns. It also tests the musher's trust in the huskies. All the safaris are led by an expert guide who knows the route. The other teams of huskies will follow this lead sled, even if the lead sled is out of sight. The safaris use trails where the snow is compacted. It is very difficult for the huskies (or the mushers) to move across deep snow. Heavy, overnight snow can make the next day's mushing hard work. All the sleds have a brake, which the musher stands on to stop the sled. Commands do not need to be shouted, as the dogs have very good hearing. A good musher works calmly, in harmony with the huskies and does not yell at them. When there is a steep up-hill section in the trail a good musher runs between the sled-runners or at least pushes with one foot, like being on a scooter. The huskies pick up very quickly whether the musher is working as part of their team, or simply expects to be pulled along as a passenger. The huskies may be a little distant in the first day or two, but usually by the morning of the third day they will start to recognise you. Try to get to know the names of your dogs. But remember, do not to get too attached to any particular dog immediately as there may be some swapping of dogs between teams in the first two days, to make sure that all the teams are moving along at an even pace. When going around corners, the line of the huskies will be curved as each pair of dogs follows the trail. If the musher brakes in the corner, the line will straighten. The wheel-dogs, the sled and the musher will then find themselves cutting across the corner in deep snow, often getting tangled in bushes and trees. Do not brake in corners unless the trail is blocked. Repetitively stamping on the brake to maintain a slower speed tires out the dogs very quickly. It is much better to use the brake gently to maintain a slower speed. Will I see the Northen Lights in Karasjok? Probably yes if you are here in the period, end of September to mid April. The northern light (aurora borealis) can be seen only against a dark sky, which must be clear. Here in Karasjok, we have a continental climate, which usually means clear stable weather and not much cloudy and precipitations. The areas here around are free of light pollution, so with no competing light sources, the clarity of the night sky is excellent. The arctic nights' unique tranquillity and the distinctive atmosphere dominate December and January. The long twilight hours are colored with hues of blue, creating a fairy-tale atmosphere. Towards beginning of February the days gradually become longer as the sun starts to reappear. For watching Northern lights, I recommend you to come before end of March. It is most frequent and intense from between 10:00 PM and midnight. Brilliant auroras often Occur at 27-day intervals as active areas on the Sun's surface face Earth during its 27-day rotation cycle. That are more frequent in late autumn and early spring. (October, February and March are the best months). The activity corresponds to sunspot activity, which follows an 11-year cycle. "Aurora Borealis", the latin name of the aurora of the northern hemisphere, means "northern dawn". Originating in the atmosphere high above the surface of the earth, the northern lights can be seen during dark hours in the polar regions of the northern hemisphere. The light is emitted when charged particles from the Sun are guided by the earth's magnetic field into the atmosphere near the magnetic poles. When these particles collides with atmospheric molecules, primarily oxygen and nitrogen, at 100-300 kilometres altitude, some of the energy in these collisions transforms to visible light. Northern light. The Sami people lives in the northern parts of four countries: Norway, Sweden, Finland and Russia (the Kola Peninsula). In earlier times Sápmi (the land of the Sami) covered a much bigger part of the Scandinavian Peninsula, probably also more of northern Russia. In this north-western part of Europe the Sami people is the indigenous population, as far as we know today. Many scientists believe that this ethnic group descends from the Komsa people, who lived along the northern coast as far back as eight to ten thousand years ago. Through the ages the Sami culture has changed very much and become diversified in the same process. The Sami were gatherers and hunters for thousands of years. They may have been farmers, too. Wild reindeer in the inland and fish in rivers, lakes and the coastal waters were among their main food resources. The Sami never created a state system, but nevertheless they had a well-organized society, with the siida as the fundamental unit. A siida was an area along a river, a lake or a fjord. Up to twelve families shared each siida, where they had different living places for each season. A siida council decided how the resources should be harvested through the year. This was a very democratic system at the core of an adaptation that didn't threaten it's resource base. When the stock of wild reindeer decreased after the Middle ages some of the families in inland siidas started to keep reindeer herds. No siida had enough grazing land for such big herds. The reindeer had to be moved from the inland plains to the coast and back again every year, crossing many siidas. This was one of the reasons for the decline of the siida system. Pressure from other people (Norwegians, Swedes, Finns, Russians) colonizing Sami land was another. In the coastal areas most of the Sami never had reindeer herds. They lived as farmers and fishermen, a traditional combination along the Norwegian coast. In the later centuries other groups have moved in among them, mainly Norwegians and Kvens (immigrants from Finland). From the 1700's pressure against Sami culture grew. In Norway the authorities tried to "norwegianize" the Sami, using the school, the church and the laws as means in this policy. Social-darwinistic and nationalistic ideas played a significant role as an ideological base. Things have changed to the better the last twenty years. This is only a crude sketch of the always interesting and sometimes tragic history of the Sami people. The Net has a lot of good information if you wish to learn more - try for instance this website. You'll find many useful links there. In earlier times the Sami were called Lapps (as in Lapland and Lappmarken) During the centuries when they were suppressed by their majority neighbours the name 'Lapp' acquired a disparaging value. In the last decades Sami (or same in Norwegian and Swedish), derived from their own word sámit, has replaced the older names. Assimilation makes it difficult to give exact numbers for the Sami population today. They are at least 30 thousand, but they may be twice as many. The majority lives in Norway, where population numbers are at their most uncertain. Not only has assimilation gone very far in many areas, in addition a lot of Sami have moved to other parts of the country. Russia has the smallest part. There are two thousand Sami on the Kola peninsula, fighting to survive as an ethnic group. A life-threatening environment in only one of their enemies! The Sami language is related to - but very different from - Finnish, Estonian and Hungarian. Is it divided into many dialects. Over the centuries each of these dialects developed until most of them became mutually unintelligible. However, the North Sami dialect is spoken by a majority of the population, and is the most used dialect in literature and education. Almost all Sami speak the official language of the state where they live, but far from all speak Sami. However, the Sami language is now expanding among the groups who lost it due to assimilation and cultural suppression. What do a Sami look like? Let me answer this way: Tall or small and every height between, blue or brown eyes - slanted or not slanted at all, from very fair to very dark hair, high or medium or low cheekbones. You've got the picture? Of course you can recognize the Sami when they wear their traditional costumes. But again, the variation is great, with many different costumes, dependent of what region the Sami belong to, and also what kind of costume they are wearing. The reindeer-herding Sami is a minority in their own culture, in Norway less than 10% of the Sami population there. But this group has always been proud keepers of the traditional values in their culture, let it be costumes, joik (their songs), lavvu (their tents), language or other cultural traits. The traditional reindeer-herding is threatened in many ways, but the Sami culture is more vital than it was a hundred years ago. Today you'll find well-educated and gifted Sami in almost every imaginable occupation on all levels of the society. They may not have a reindeer herd in the mountains, but they are without doubt Sami and proud of it. The Sami Assembly is a national body, subordinate to the general regulations of public administration. Its sphere of activity, right of recommendation, and authority are laid down in the Sami Act. The Sami Parliament has the power of decision insofar as this is laid down in the Sami Act or otherwise. The representatives to the Parliament are chosen by direct ballot by Sami who are registered in the Sami electoral register. Its activities are steered through a special administration in Karasjok. Among the major issues it took up during its first operational year were the situation for reindeer-herding and for fishing, the language question, and the construction plans of the Norwegian Armed Forces in Sami territory. How is Sven's result in dog sledding competition?